As you seen from my profile I am actor and model. But also I am qualified wildlife conservationist and animal behaviorist. 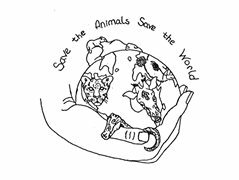 I run a organization called 'Save the animals, Save the World' . Dedicated to the preservation of all life and the natural world. the purpose to educate and spread awareness and enthusiasm for conversation! I have many projects running! But I really want o do wildlife and animal documentaries on all different matters, from episodes based on particular animals, to extoic pets, etc. I need a team to do this. I can present myself, and my knowledge is beyond that of most, plus I am experienced working with animals hands on too! If we can get a crew together and start working on this. This is strictly for the love of animals and nature. No profit ( If a network wanted to pick it up and pay us...Lovely jubly) we will work this to spread awareness for conservation! let me know, anyone is welcome.